Assistant Professor Matteo Cacciatore has just been appointed Faculty Research Fellow at the National Bureau of Economic Research (NBER), the leading economic research organization in the United States. Matteo Cacciatore is the first professor of our School to become a member of this selected group of researchers, and one of the very few among all Canadian universities. This appointment will definitely bring significant additional visibility to our institution among the very best researchers of the scientific community in economics. 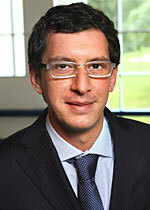 Matteo Cacciatore joined the HEC Montréal faculty in 2010. He holds a PhD and an M.A. in Economics from Boston College, as well as a B.A. in Economics from Bocconi University. His research fields are international macroeconomics, macroeconomics and international trade.